It's getting to be that time of year again - if I'm going to sew anything for Christmas decorations or holiday gifting - better get started! 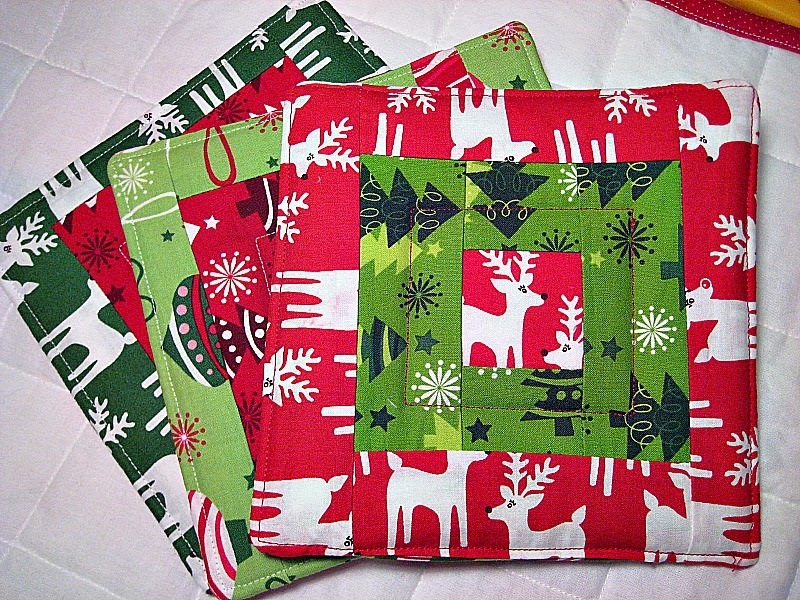 So I whipped up a few potholders in a Christmas theme. These make great gifts by themselves or bundled with some baked goods and you can make them to fit any theme, of course, maybe Thanksgiving is more on your mind! Or you can make them to coordinate with the kitchen, etc. I made mine patchwork - both front and back. 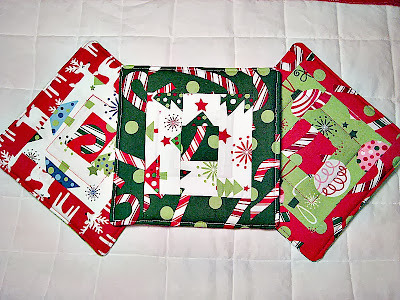 I used a jellyroll in Christmas prints (Robert Kaufman, maybe? I'm not sure. I bought it last year. If anyone knows please let me know!) 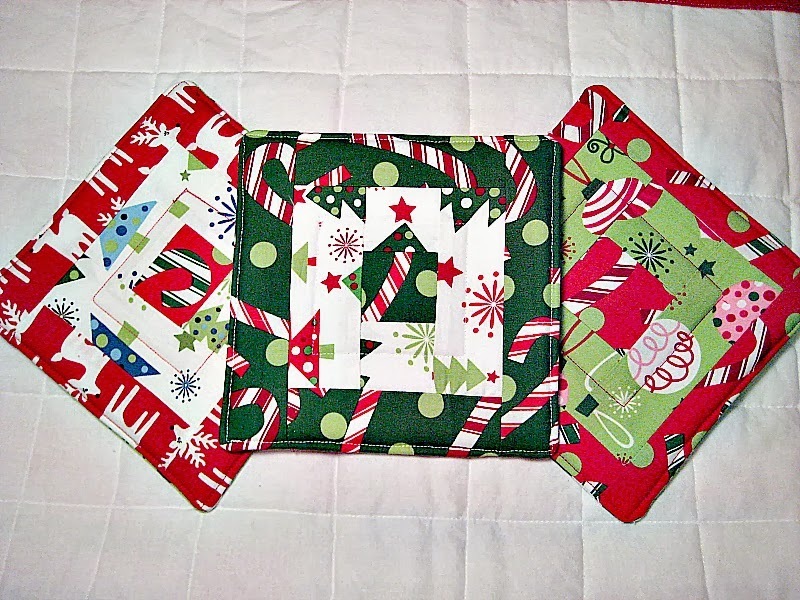 But you could make a patchwork front and use a plain back, or just use any fabric you love! 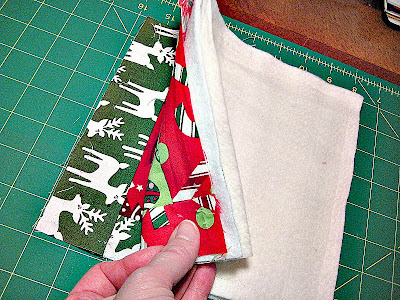 Cut your fabric and batting to the same size - I made mine about eight inches square. Remember that the finished size will be smaller because of the seams. 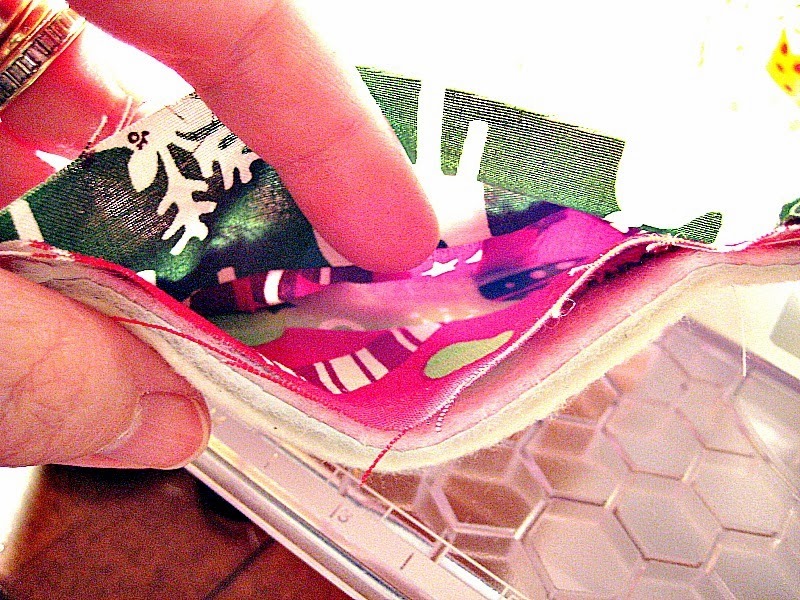 I sewed with an 1/2 inch seam, so my finished size is 7 inches square. Make them any size you like. Once you have cut everything it's time to layer it all up and sew. We are using a turned finish, so lay your front fabric face up, your back fabric face down, then the two layers of batting on top. Pin in a few places to keep everything together. Leave an opening along one side about an inch or two in from each edge for turning. I use a walking foot. This is lots of layers to keep a handle on and the walking foot really helps! If a walking foot did not come with your machine, I recommend purchasing one. 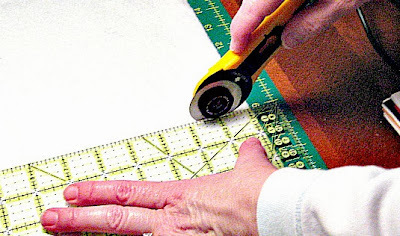 It is a super help with quilting! IMPORTANT! 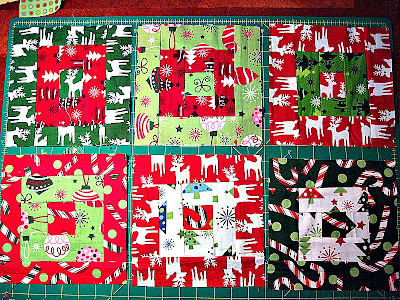 Before you turn it right side out, clip all the corners on a diagonal to take some of the bulk out of the corners. 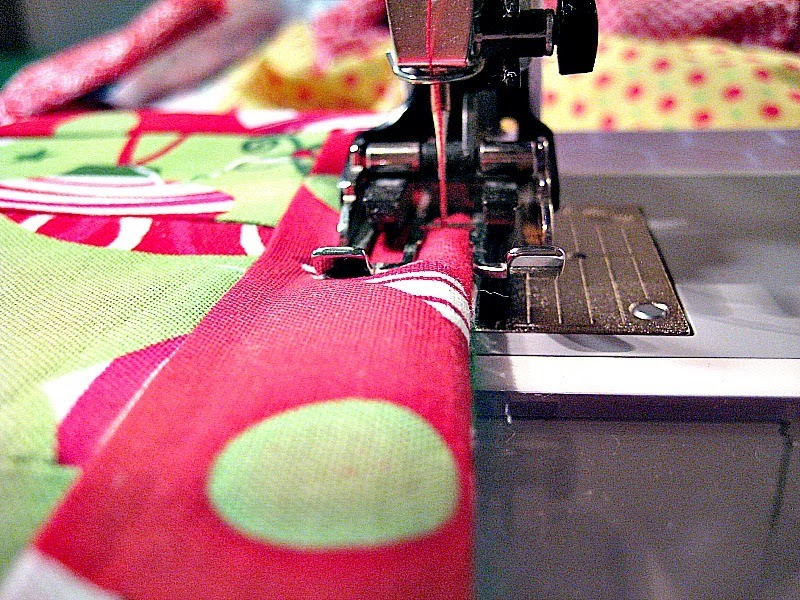 Be careful not to cut into the stitching! I also like to trim the batting down to about 1/4 of an inch. But NOT the fabric. Reach in between the two fabric pieces and turn it right side out. Use something to help push out the corners. I use my fingers or the eraser end of a pencil. The eraser sort of grabs the fabric and helps push it out. Next, press it nice and neat. Turn under the edges of the opening so the raw edges are on the inside and press well. Top stitch close to the edge. 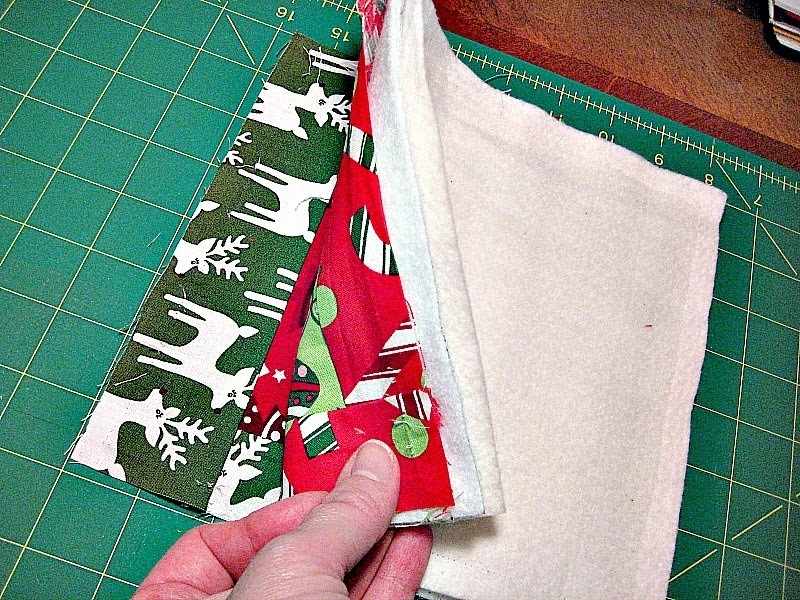 Sew all the way around closing the opening and flattening the edges. 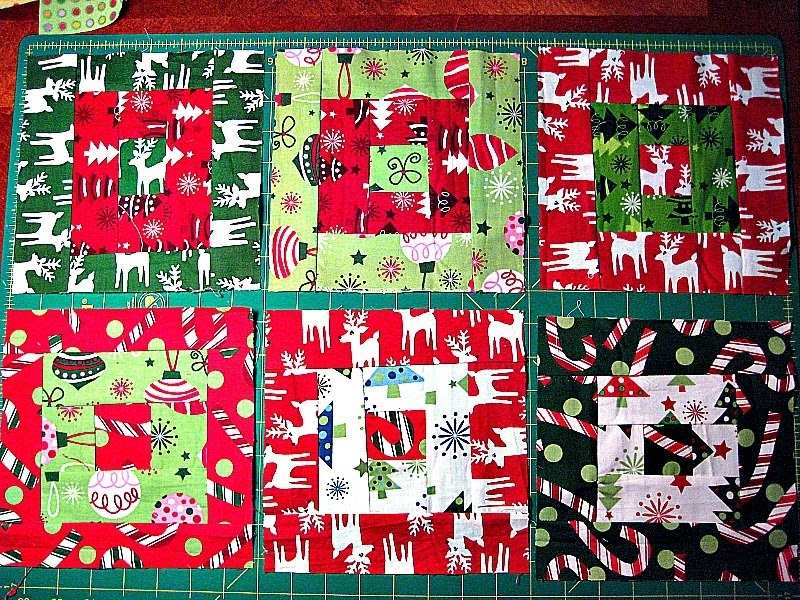 Then add more stitching for quilting - I don't do much - just enough to keep it all together. That's just my taste - add whatever you like. And you're done! Whoo hoo! Enjoy or give to a friend to spread a little Christmas cheer! If you make one (or a bunch) leave a link so we can see. I'm linking up with Sew Darn Crafty and Anything Goes and Fabric Tuesday and Sew Cute Tuesday! What a splendid idea! Thanks for the tutorial. Yours look great. These would make a nice hostess gift too! So Christmassy! What a nice present they would make. Hi Melanie. I could not find an email address for you so I am replying here. I have edited the post near the bottom with an explanation and a link to a nice diagram for the block. I hope it helps! Please don't hesitate to ask more questions if you have them. :) If you make some potholders I'd love to see them. Good Luck!